Dubbed the "friendliest" glasses you'll ever own, all 6 Main + Central styles come in three sizes, and four shades, with an eco-conscious design to fit with your daily look. I was lucky enough to get a free pair of Friday frames in black ($50) and have been wearing them nonstop. They remind me so fondly of my first pair of Clearly glasses, the Love Black & Pink style that I bought back in 2012. Reviewed here. This classically winged-out frame has a subtle cat eye shape that's smooth, feminine and a bit retro. They're heavier than my green Michelle Lane's, but the Friday style has so much personality, they pair perfectly with a sleek ponytail. The details on these frames are impeccable. I love the little gold diamond emblem, and the hinges are top quality. The frames are shiny, solid and comfortable. I went by their store on Queen St. W in Toronto to get the frames custom fit, like usual. You can even pair sun or digital protection lenses with any Main + Central frame. Add your prescription and choose BlueReflect lenses (for cutting computer screen glare), or one of the 100% UV protective sun tints from a classic solid grey to a shimmering mirrored green. Every Main + Central frame comes with Standard Air lenses, a customized pouch, a hard case, and a cleaning cloth – all for one inclusive price. Main + Central frames are constructed with Natura acetate – a highly durable, long-lasting material that can be biodegraded when you’ve decided to move on to a new style. You can call customer service at 1-866-414-2326 to return your frames for recycling, and they’ll give you a $5 credit to spend on your next pair. My glasses wardrobe is sufficiently full, and I now have a pair for every occasion. 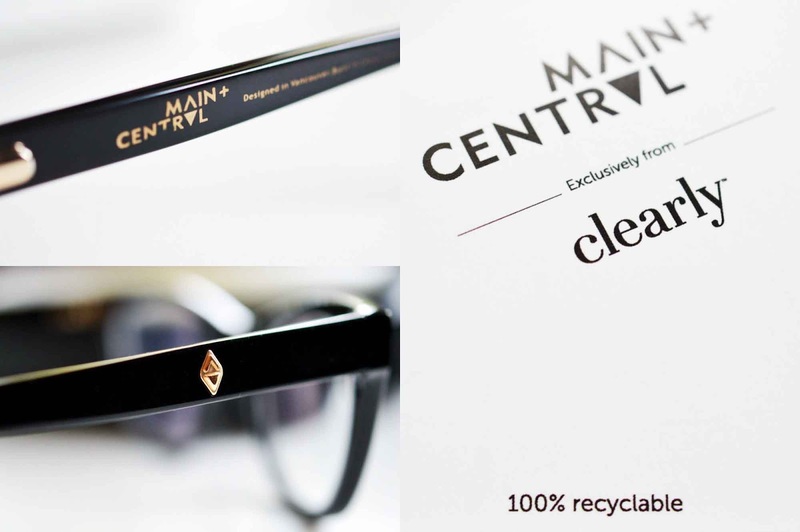 Buy your own pair of Main + Central frames here, and don't forget to use Ebates! They have a 15% off code and 4% cash back at Clearly right now. Hi! I'm thinking of buying these. But can't figure out what size to get. What size did you get?